Could the Trump administration signal the end of the first truly American Century that may not last quite a century? What I cam referring to as the American Century is the period between the end of World War II (1945) to present, a period of about 77 years. Before I elaborate on this question, let us first discuss how the American Century came to be in the aftermath of the devastation of World War II and its very important significance for the United States as a global power. The post WWII era was the first time in history where the United States emerged as the most powerful nation on the planet. Before he passed, President Roosevelt had begun to lay the groundwork for international institutions designed to nurture a lasting world peace with the United States at its center. It is no mistake that the United Nations, World Bank, and International Monetary Fund all reside within the United States. Through these institutions, the United States summoned the world to its side with a mandate to embrace its values of democracy, human rights, free markets, and free enterprise. Even outlying authoritarian regimes like the former Soviet Union had to at least engage in a pretense of embracing some of these goals in treaties and rhetoric…look no further than the Universal Declaration of Human Rights. All of that changed with the candidacy of Donald Trump in his America First mantra where he painted the world largely constructed by the US in its current form, as our greatest enemy, fraught with ungrateful allies, every immigrant as a would be terrorist, and East Asians scheming to steal the rug from underneath us. 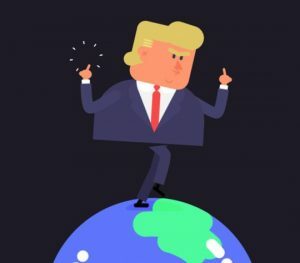 Trump as president from the day of his inauguration has only furthered that narrative and reality as he has threatened NAFTA, pulled out of the Paris Climate Agreement, and pulled the US out of the Trans Pacific Partnership, citing each as a “bad deal” for the US. Yet, while the rest of the world moves on without Trump’s America, there are NO deals on the global stage. Having turned away from trade agreements and threatening NAFTA, has Trump’s America First paradigm benefited his largely non-college educated white male base that voted him into power? Not at all. This segment of the population while still resoundingly loyal to Trump, remains nonetheless left behind in the global economy where the manufacturing sector has largely moved abroad in countries with a much cheaper unskilled labor force. 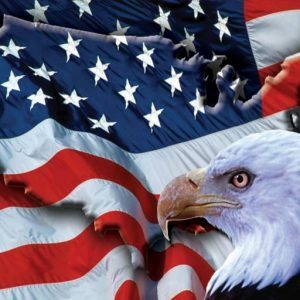 While it sounded great as a campaign slogan, America First has accomplished nothing but to leave China increasingly poised to fill the void the United States will leave behind if it does not change course…only devoid of many of the values that Americans hold dear and have largely influenced the world the United States created in its own image.